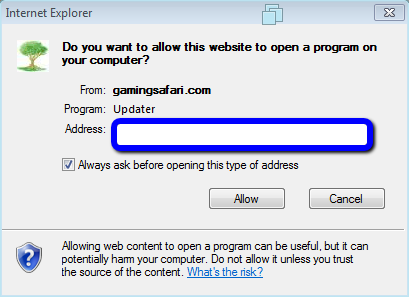 1) Click on the Software link at the top of any Gaming Safari page. 3) Click the Download Now button. 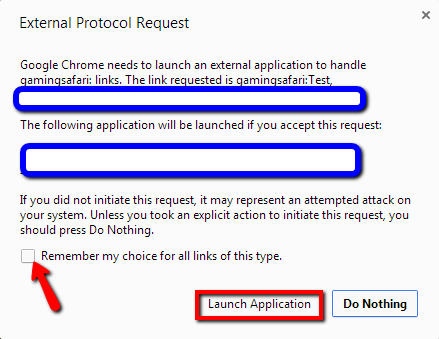 When prompted, Run (Internet Explorer) or Save (Firefox or Chrome) the file. 5) Follow the installation instructions. You will be prompted to allow our website to open a program. Uncheck "always ask" then press Allow. You will be prompted to select a helper application when clicking on a room. 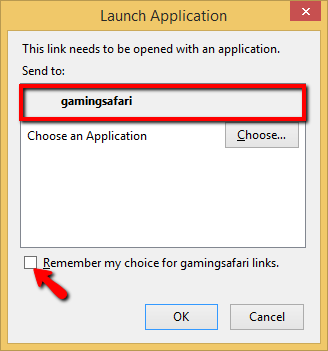 Select gamingsafari, then press Remember. Then click okay to launch the room. You will be prompted to allow an external protocol request. Click Remember then press Launch Application.